No jokes here you pinko commie bastards! USA USA USA USA!!! and here's #22.... cuz I ain't never seen it. I know, OOOOOHHHH MAN you never seen it?!?!??! Haven't seen Hooisers either so get it out of your system now you jerkfaces! PS.... I wish I had some great idea for UFC post, but basically we went to Portland... got all kinds of drunk and watched the fights. It was a great time. Hopefully I'll get creative this week. For the first time ever. 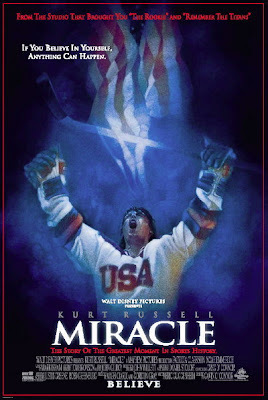 My favorite part is after they (SPOILER ALERT) beat the Russians whe Herb walks back into the tunnel right away and celebrates by himself because he doesn't want the players to see it. I was slightly disappointed with Miracle. The HBO documentary is much better in my book and I was able to pick it up for 5 bucks at Best Buy when I bought movie.